Tapeworm (cestoda) is a class of parasitic flatworm that can infect human's digestive tracts. Infection usually occurs through ingesting foodstuff and water contaminated with tapeworm larvae or cysts. After it is ingested, the tapeworm cyst travels to the intestine and develops over a period of 2 months into an adult tapeworm, which can live for years. The adult tapeworm attaches itself to the walls of the intestine by using suckers and hooks found in its head region or scolex. Scolex or head of the tapeworm. Notice the hooks it uses to attach itself to the intestinal wall. What Are The Different Types Of Tapeworm? 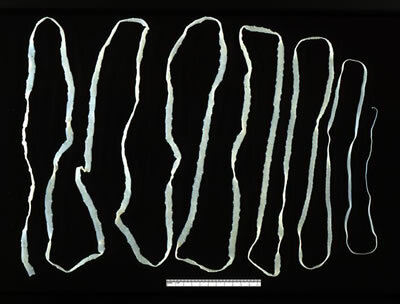 This tapeworm comes from cows, and can be found wherever there is cattle farming. Humans who eat undercooked beef that has worm cysts can get infected. Beef tapeworm can grow up to 25 feet in length inside the human intestine. Although rare in the North America, this type of adult tapeworm infection is common in South America (including Mexico), Eastern Europe, India, China, and Southeast Asia. In addition to eating undercooked pork, a person can also get infected by eating or drinking contaminated food and water, as well as by hand-to-mouth contact after touching something that contains the tapeworm cysts. Pork tapeworm can grow up to 21 feet inside the intestine. In a disease called cysticerci, pork tapeworm larvae or cysts penetrate the intestine and travel through the bloodstream and infect various organs, such as the brain, spinal cord, muscles, and even eyes. In this disease, symptoms can occur months or even years after the initial infection and can be difficult to diagnose. This type of tapeworm infection can be found in Europe, Japan, North and South America, as well as in certain parts of Africa. Fish tapeworm infection occurs by eating raw or undercooked freshwater fish, including salmon. Inside the intestine, it can grow up to 25 feet in length. 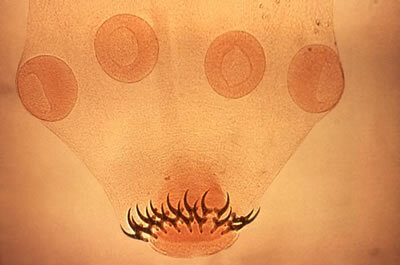 This type of tapeworm infects humans through an intermediate carrier, such as fleas, beetles, and cockroach that carry the cysts. Rodent tapeworm can grow up to 20 inch long in the intestine. Similar to rodent tapeworm, dog tapeworm can infect humans, usually children, who accidentally ingest infected flea or louse. It can grow up to 24 inch. Unlike other tapeworms, the native host of dwarf tapeworm is man. It infects another human through ingestion of food contaminated with feces. Dwarf tapeworm is the smallest of all other worms, and can grow up to 12 inch in the intestine. Signs of tapeworm infections include elevated levels of eosinophil (a type of white blood cell), presence of large and pale red blood cells, vitamin B12 deficiency. Tapeworm segments in the stool can be detected by a microscope. Avoid sushi, fruit, salad, and even ice when traveling to areas known to have tapeworm outbreaks. Prescribed to eliminate the tapeworm infection, antihelminthics such as niclosamide and praziquantel, have a very high success rate of over 95%. Usually, segments of tapeworm start to be shed in the feces within 48 hours of taking these medications. After a round of antihelminthics, your doctor may prescribe a gentle laxative to help purge segments of killed tapeworm from the intestine. Treated properly, the prognosis for tapeworm infection is very good. If no tapeworm segment is found in the stool 4 months after the initial treatment, the person is cured.